I am still making good (but clearly slow-ish) progress with my colour definition quilt. I would be going faster, I think, if I hadn't spent so much of my time this week reading the dictionary. I am fiddling around with little bits of layout, but it's pretty clear that I need to make more circles, in all sizes, to give myself more scope. Here's my floor right now. I like the top two rows, but not the bottom one here; the 3rd big circle in needs to be at the same level as the others, I think. I guess this may be put together in rows and I want to break them up a little bit, but this clearly isn't the way. I also want to use the strips a bit more: I really like how they look stacked up so will see if there's a way to get little moments of that in somewhere. And now, again, back to basting circles. I really like the strips especially the petrol blue colour - loving this whole process you are sharing! Making good progress, I love the different size circles! This is coming along! It gets better and better! I agree on the top two rows, but you'll work it out and when you do it's going to be even more amazing! Keep going! Reading the dictionary; I love that and the way the mix of sizes and text is going to be pulled together in this project. I love the colors and the dictionary definitions. Another wonderful project. What fun! Love that dark sashing. Makes the circles 'pop' and look very present! This is looking great. Love that you are reading the dictionary. When I went backpacking around the world many, many years ago I missed having a dictionary so much that I bought a little one and toted it around!! I agree with your assessment of the third row. This quilt is very attractive. I like the arrangement, the sashing adds interest and movement. I think you're right about the third circle being on the same level as the other two - having said that this is absolutely wonderful! It's looking lovely. I do agree with you about the circle in the bottom row though, and will be interested to see how you resolve it. The stripes and circle combo is ace! I like the striped circles as much as the denim, or maybe even more, they remind me of Saturn. Your different sizes make it playful too. I have started on my daily 365 cirlces. I love to see how you are coming along with yours! You are making such great progress. Love seeing all your circles together. They act together in a beautiful harmony. I'm not sure I agree with the others that that circle needs to be on the same level. You could try adding a sashing between the two big circles, or try moving that circle farther to the right. I´m overwhealmend. This combination of colors and different sizes is really great. You wrote "I would be going faster, I think, if I hadn't spent so much of my time this week reading the dictionary." and it took me back to when I was young Kaja. I often got caught up in the dictionary. A dictionary of color definitions would be very distracting, LOL. I'm not sure if the third row needs to be changed. 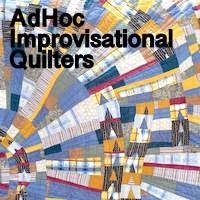 What I do know is that this quilt is amazing!